Few companies have experienced the ups and downs of the commodities cycle like Newcrest Mining Ltd., Australia’s biggest gold producer, whose shares have soared as high as 36 Australian dollars (US$28) and crashed to as low as A$7 over the past three years. One of the worst periods was 2013, when Australia’s securities watchdog began investigating the company’s disclosure practices; its chairman and chief executive both said they were quitting; and it was forced into a humiliating US$6 billion write-down of assets it purchased during gold’s decadelong bull run. More recently, Newcrest has begun to recover some of its shine. Its shares are trading at an 18-month high, buoyed by the weekslong run-up in gold prices amid concern over the health of the global economy. And on Friday, Newcrest surprised investors by setting a higher annual production target. The company said it expected to produce between 2.3 million and 2.5 million troy ounces of gold in the year through June, compared with an earlier 2.2 million-2.4 million forecast. Management also reported a 2.7% increase in gold output in the final three months of last year, and lifted its estimate for copper output in the current fiscal year by up to 20%. The brighter news, announced in a second-quarter update, follows a spate of production downgrades in recent years, and routine disappointment for shareholders when hoped-for guidance upgrades failed to materialize. A one-time darling of Australia’s share market, Newcrest has faced setbacks of almost every sort: from engineering faults at its mines and rain disrupting operations to unexpected tax bills. The producer, which was forced into write-downs as recently as August, has been working hard to rebuild its image by focusing on improving the reliability of its global operations. Still, Friday’s upgrades failed to put much of a spark under Newcrest’s stock, which has already risen by more than 25% this year. Investors remain concerned, mainly, about the outlook for its Lihir mine in Papua New Guinea, which Newcrest acquired as part of its A$9.5 billion takeover of Australian-listed rival Lihir Gold Ltd. back in 2010. The mine, which Newcrest had high hopes for, has faced repeated setbacks, including several unplanned disruptions caused by problems with processing machinery and conveyor belts at its facilities. “Lihir continues to underperform against its potential,” Newcrest’s chief executive, Sandeep Biswas, said on Friday, but added that he was confident the right strategy and people were now in place to boost production at the operation. Gold output at the facility was below the company’s expectations and costs rose, the company said in the quarterly update. The performance of Newcrest’s other operations was patchy. 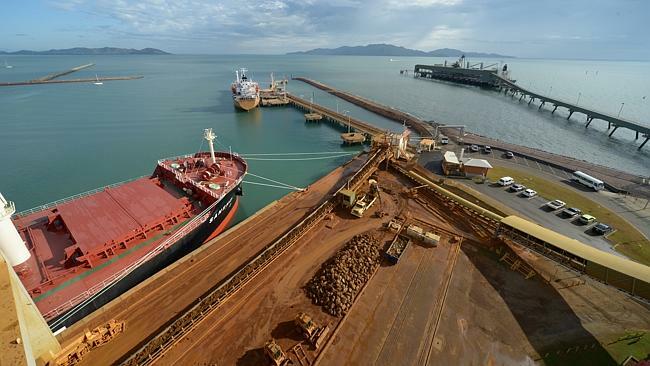 It recorded strong second-quarter output at its Cadia and Telfer mines in Australia, but weaker-than-anticipated production at its Gosowong mine in Indonesia and Hidden Valley operation in Papua New Guinea. A pullback in the gold price in recent days is also causing investors to tread carefully, according to local fund managers. Gold futures posted their sharpest decline—2.4%–in more than a year on Thursday as a more-hawkish Federal Reserve signaled the U.S. economy was strengthening, dampening demand for bullion which is often treated as a haven in turbulent times. 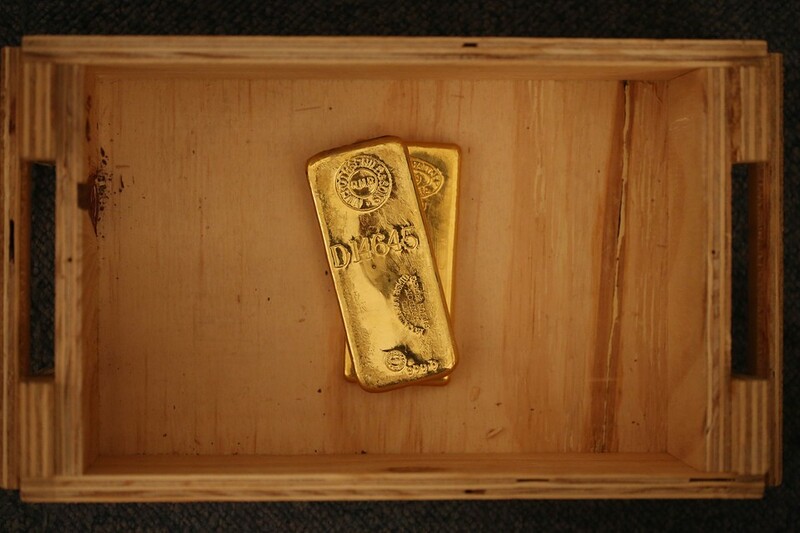 “Even if management resolve the issues at Lihir, it’s certainly going to be a difficult proposition to show increasing profits when gold faces such a big macro headwind,” said Angus Gluskie, managing director of White Funds Management in Sydney, pointing to the scope for the greenback to strengthen when U.S. interest rates eventually climb, reducing the allure of gold to investors. AUSTRALIA’S biggest gold miner Newcrest has lifted its full year production target while lowering its costs. CHIEF executive Sandeep Biswas said he was happy with Newcrest’s Australian mines, but disappointed with the performance of its major Lihir operations in Papua New Guinea, which achieved a lower than expected production increase. Milling operations at another PNG mine were also stopped for 17 days following the death of a worker in early December. Stronger than expected overall production in the three months to December was achieved as capacity upgrades at Newcrest’s largest Australian operation, in NSW’s central west, progressed ahead of schedule. Newcrest now expects to produce between 2.3 million and 2.5 million ounces of gold in the 2014/15 year, up 100,000 ounces on its previous guidance. Copper production guidance has also been lifted to a range of 90,000 to 100,000 tonnes, up from the previous guidance of 75,000 to 85,000 tonnes. Newcrest also lowered its full year all-in sustaining cost guidance, to a range of $2.3 billion and $2.5 billion, due to stronger copper production and improved efficiencies. But the company’s shares have fallen, as the gold price endured its sharpest drop in more than a year. The price fell due to a stronger US dollar, and a move by traders into other investments in anticipation of an interest rate rise in the US. Newcrest shares dropped 14 cents to $13.56. “Porgera Joint Venture (Barrick PNG Ltd) is the pioneering company in using the TCS concept but TCS itself is not the brainchild of PJV but rather a borrowed concept from me,” Mr Rau said. The current commercial Services manager of Barrick through its legal officer Christopher Trainor when contacted by the paper last Friday referred the matter to the government stating “Barrick don’t get any benefit from this concept, they pay taxes to the government for infrastructure development” and even refused to answer as to who the initiator of the TCS concept is. The provincial government through their then legal officer Mr Harry Derkley stating in one of their letters, dated May 14, 2001, “that TCS was established by an act of parliament and has been used by other resource developing companies apart from the PJV. The appointment was made and approved by PJV without any form of consultation for approval by the EPG or state authorities”. Demands by the ex-combatants for Autonomous Bougainville Government President Chief Dr John Momis to resign has been deemed as undemocratic. President Momis said that though the ex-combatants, led by former Bougainville Revolutionary Army commanders, Ishmael Toroama, Sam Kauona and Thomas Tari could voice their concerns on the government’s priorities on development, demanding his resignation without due cause cannot justify their demand. This ultimatum was issued through a letter to the President questioning his ability to act in the best interest of Bougainville while outlining certain ABG ventures that it deemed were an utter failure and that if answers provided by President as unsatisfactory would warrant his removal from the Presidency. “The ABG has already explained the dealings questioned by the ex-combatants clearly and concisely so what is the criteria that warrants me to resign as President,” President Momis said. “As the democratically elected leader of Bougainville what criteria justifies their demands for me to resign, without properly assessing the government’s development priorities before leveling accusations against me as head of the Autonomous Bougainville Government,” the President added. President Momis declared that his government has done more in terms of development of infrastructure and policies in Bougainville than the last government. He said though there were constraints within the Public Service and the ABG’s financial capacity the government had done all it can to strengthen Bougainville’s drive to reckoning its political destiny through and through. The President’s sentiments are evident through the stability within the government and its development capacity during the last five years of the Momis Administration. In the last 5 years of President Momis’ tenure as ABG President there has been an improvement in relations with the National Government with the President negotiating the K500 million Special Intervention Fund from the Somare Government, rescoping the ABG’s priorities on Mining and initiating important legislations. With the ABG elections looming the President said if they really desired a change in the leadership in Bougainville then he encouraged them to partake in the elections where he said offers a level play ground for them all. “The people will then decide on who they want as their leaders to lead Bougainville,” President Momis said. The Autonomous Bougainville Government faced off with former combatants in a civil debate on issues pertaining to Bougainville’s stability at the Bel Isi Park in Buka Town on Friday. The ex-combatants were led by former Bougainville Revolutionary Army strongmen, Ishmael Toroama, Sam Kauona and Thomas Tari who were dissatisfied with the ABG’s current development priorities. In letter to ABG President Chief Dr John Momis the ex-combatants raised concerns on the replacement of the ABG’s Acting Chief Secretary, Chris Siriosi, the ABG’s involvement with the Torokina Oil Palm Project, the benefit sharing arrangement of the Bougainville Flagship MV Chebu and government ministers owning shares in POGE Bougainville Development. President Momis who bore the brunt of these accusations down played them and explained that there was no foul play on the government’s part as they followed every legal procedure to develop these projects. “There was a need for a change in the Bougainville Administration in particular the Bougainville Public Service,” President Momis said. “The appointment of the new Chief Secretary was done by an independent body, as is stipulated in the Bougainville Constitution, that was free from political influence,” the President said. On the matter of the Torokina Oil Palm Project that was deemed to be failure by the combatants, President Momis again explained that the project was still ongoing and was proving to be a success in the light that progress on its development though slow was moving with certainty. The President also explained MV Chebu’s benefit sharing arrangement, where Hakau Limited and the ABG owned 50 percent of the management company Chebu Shipping Company Ltd.
“Hakau Ltd is managing the company as past experience has shown that we could not properly manage previous vessels owned by the government simply because we lack the capacity to do so,” he explained. President Momis then finally explained the reason behind ABG Ministers owning shares in Bougainville POGE Development were in fact as trustees only and that these shares were already transferred to the Bougainville Public Investment Company, the ABG’s business arm. The 50 percent stake of the ABG in MV Chebu will also be transferred to the holding company that will take care of all the government’s business ventures. A panel led by Bougainville Catholic Diocese Bishop Bernard Unabali said the points raised by the ex combatants and the ABG would be analyzed to address them. Gold miner St Barbara increased its gold production during the second quarter ended December, on the back of record quarterly production from it Leonora operations, and the highest monthly and quarterly production at its Simberi mine, since the project was acquired in 2012. Group gold production for the quarter reached 97 917 oz, compared with the 68 823 oz produced in the previous quarter. The Leonora operation, in Western Australia, accounted for 80 623 oz of this production, with the Gwalia mine and King of the Hills operation delivering 68 489 oz and 12 034 oz, respectively. The increased gold production at the Leonora operations reflected an increase in volumes and grade, as well as the availability of high-grade stockpiles at Gwalia, which were created during the September 2014 maintenance shutdown. The Simberi operation, in Papua New Guinea, delivered a further 17 294 oz during the quarter, with production at the mine benefiting from operating the semi-autogenous grinding mill and ball mill in parallel. St Barbara noted that the engineering and maintenance programme to improve the performance of the Simberi processing plant was now largely complete, with a shutdown of the mill circuits completed during the quarter. Despite the shutdown, mill throughput increased by 15% on the previous quarter, with 620 000 t milled, including a record 252 000 t in the month of December. Operations at the Gold Ridge mine, in the Solomon Islands, remained suspended during the quarter, and St Barbara noted that negotiations with the local government regarding the potential transfer of ownership had made little progress. No agreement had been reached on the necessary dewatering of the tailings storage facility, despite the company’s installation of the necessary infrastructure in anticipation of such an approval. St Barbara told shareholders that the company was reviewing its strategic and legal options in relation to the Gold Ridge mine. Looking ahead, St Barbara on Wednesday increased its production expectations for the Gwalia mine, from between 180 000 oz and 200 000 oz, to between 200 000 oz and 210 000 oz for 2015. With production at King of the Hills coming to an end during the June quarter, St Barbara was expecting the project to deliver between 50 000 oz and 55 000 oz of gold, instead of the previous estimate of between 60 000 oz and 70 000 oz. Simberi, meanwhile, was still expected to produce between 70 000 oz and 80 000 oz of gold during the full year, with production expected to increase to a rate of 100 000 oz/y by the June quarter. The Australian miner Axiom says its nickel mine subsidiary development in Solomon Islands, Axiom KB, is on track for production to begin at the end of the year. Axiom KB’s Chief Executive, Ryan Mount, says prospecting operations in Isabel province are well underway and the company and its landowning partners are working hard to achieve the ambitious end-of-year start. Mr Mount also says Axiom’s initial drill tests have come back with some unexpected but exciting results. Ryan Mount says the only blip on the horizon is a court of appeal case involving the Japanese mining giant Sumitomo. The Solomon Islands high court has ordered Sumitomo to pay about 3.8 million US dollars in court costs over a legal battle over who owned the Isabel nickel deposit. 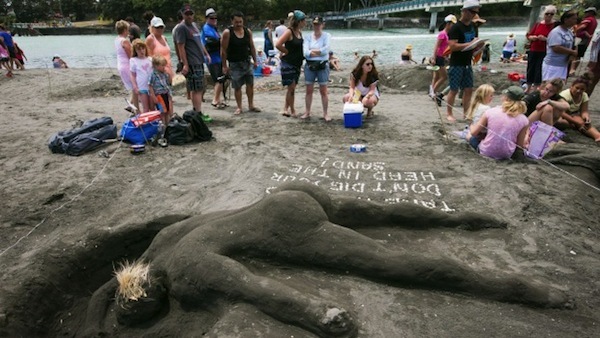 Inaugural Raglan Sand Sculpture building competition hosted by Anti-mining group “Kiwis against Seabed mining (KASM). 47 teams participated in the competition, held to celebrate KASM’s win against Trans Tasman Resources. They were a small core group of New Zealanders that took a stand against a large mining company and won, and for their efforts they put on a celebration that incorporated the sea, the sand and the people. 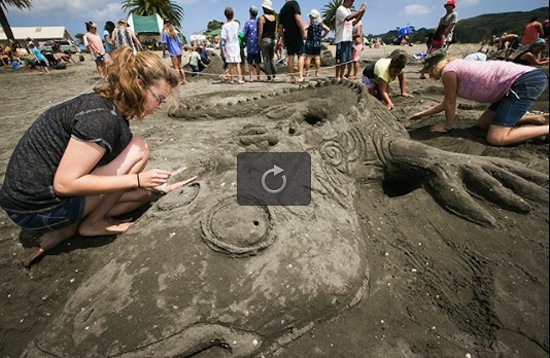 Kiwis Against Seabed Mining (KASM) held its inaugural sand sculpture competition on Kopua beach in Raglan yesterday to celebrate its win against Trans Tasman Resources (TTR) which wanted to mine 50 million tonnes of iron sand from the seabed off the West Coast. TTR planned to appeal the decision handed down from the Environment Protection Authority that rejected its application, but withdrew in December last year. KASM chairman Phil McCabe said a sand sculptor competition was a fitting way to celebrate their victory. “It is about our beach, our water and about the people. “It’s a very fitting way to incorporate everything while having fun,” he said. McCabe paid tribute to the many supporters of KASM that came from all over the country. Forty-seven teams made of of families, friends and youth groups took part in creating sand sculpture masterpieces for prizes donated from local businesses in Raglan. Locals and visitors set to work creating mythical creatures, castles, campervans as well as messages supporting KASM. Amelia Penfold with friends Ella McLeod-Edwards and Maiterangi Brown created a 2-metre-long tuatara. Friends Peata Jones and Garbi Klapka did not hold back when describing the actions of those who chose to ignore the issue of seabed mining. 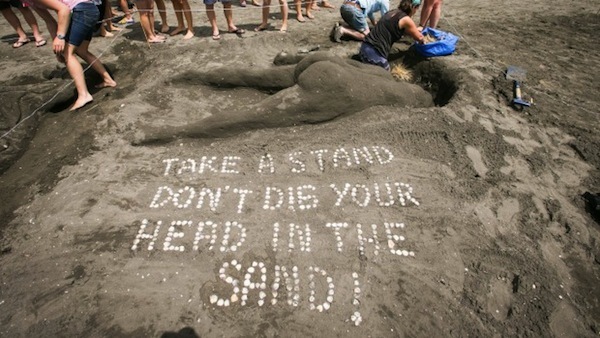 They sculpted a person lying on the sand with their head in a hole, with a message designed with seashells that read: “Take a stand, don’t dig your head in the sand”. Klapka said they wanted to do something a little different. McCabe said KASM was pushing for a moratorium on seabed mining. Landowners in Namosi Village are split, claims the head of the mataqali Nabukebuke in the village Daniele Vakatawabai. This had led to a roadblock in the area being explored for mining by the Namosi Joint Venture. Mr Vakatawabai told the Fiji Sun at Namosi Village yesterday that the roadblock has now been lifted and the Namosi Joint Venture could use the road. “Those who carried out the roadblock are causing the split,” he said. He added the Namosi Joint Venture wanted to caryy out drilling at Wainaba, but other companies had already carried out drilling at that place. “Na qivaqiva sa vakayacori oti e Wainaba mai na yabaki 70 kei na 80, (Drilling at Wainaba had started in the 1970s and 80s),” he said. The new committee, he said, had laid out a five-year dalo planting plan for the clan and the advice from the Namosi Joint Venture was to involve the Ministry ofAgriculture so that Government was involved. The officers from the Ministry of Agriculture responded positvely to the mataqali’s request and Mr Vakatawabai said they conducted a survey and tested the soil at Wainiba. “The soil at Wainaba was found to be good for our dalo project and it is mataqali land,” he said. “Just when we were about to start with this project at Wainiba, the roadblock started. He said the group said they were erecting the roadblock because the piece of land was for them to feed on (kanakana). However, Mr Vakatawabai said currrently members of the Nabukebuke clan were planting on land given to them and they wanted to move their plantation to their own piece of land, but the group just erected the roadblock. He said they wanted to move to that piece of land because the company wanted to carry out drilling further up. Mr Vakatawabai did not want to go into details about this issue, as it was now a Police case. On their project, he said currently they had 55,000 dalo plants on the ground and in February, they would plant another 55,000. Village headman and spokesman, Atonio Anasa said Namosi Joint Venture had supplied them with manure, weedicide, three chainsaws, 20 knapsacks, 20 digging forks, 50 manure Teitei blender, 20 barbed wire coils, drums, nails, hammers, etc. The company, he said, bought the clan $31,000 worth of farming equipments. He claimed no financial assistance has come from Government and they were hoping help would come their way one day. They have the market and the plan is to send a container of dalo every month overseas. Mr Anasa said Police were at Namosi yesterday to continue their investigation on the roadblock.